Bolton Affirms U.S. Intent To Pull Out Of Arms Treaty With Russia The national security adviser said the U.S. will leave the INF Treaty "in due course" — and that President Trump and Russian President Vladimir Putin would like to speak directly again next month. National Security Adviser John Bolton speaks with Russian President Vladimir Putin at the Kremlin on Tuesday. After their meeting, Bolton told reporters the U.S. still intends to withdraw from the Cold War-era Intermediate-Range Nuclear Forces Treaty. The U.S. intends to follow through on President Trump's threat to leave a Cold War-era nuclear arms treaty with Russia. National Security Adviser John Bolton confirmed the plan Tuesday in Moscow, not long after speaking with Russian President Vladimir Putin in person about the decision. Bolton echoed Trump's comments days earlier, when the president cited Russian violations as sufficient reason to "terminate" the 1987 Intermediate-Range Nuclear Forces Treaty, better known as the INF Treaty. At the time the agreement was signed, it was greeted as a landmark gesture of conciliation between the U.S. and the Soviet Union — but now, more than three decades later, Bolton says Russia is taking advantage of the bargain. "It is the American position that Russia is in violation. It is Russia's position that they are not in violation," Bolton told reporters, noting that officials in the Obama administration had also alleged Russian violations of the pact dating back at least to 2013 — and had also been met with denials. "So one has to ask, how do you convince the Russians to come back into compliance with obligations they don't think they're violating?" He said he had engaged in lengthy discussions with Putin about the planned U.S. withdrawal. 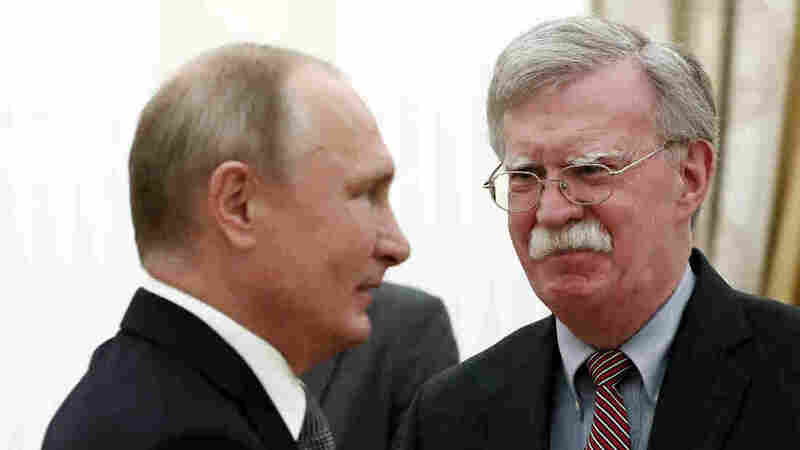 Bolton did not detail the Russian president's reaction, though earlier in the day a Kremlin spokesman made clear the country was against the move. "Certainly, there are bottlenecks. But ruining the treaty in a situation where even hints at concluding a new one do not exist is something that we do not welcome," Dmitry Peskov said, according to the Russian news agency Tass. Later, he called Trump's intention to withdraw from the treaty an "extremely dangerous" move that would "make the world more dangerous." The two countries' leaders should have an opportunity to discuss the matter in person, at least. Bolton said both Putin and Trump have expressed interest in holding direct talks next month in Paris, on the sidelines of events commemorating the centenary of the armistice that ended World War I. "So we will make the precise arrangements on that," Bolton said. On Wednesday, Peskov said Russian and the U.S. had also discussed the possibility of Putin visiting Washington, D.C. It either case, it would be the leaders' first such dialogue since a meeting last summer in Helsinki, Finland. During a news conference afterward, Trump said he believed Putin when Putin asserted that Russia didn't interfere in the 2016 election. Those comments caused widespread consternation and rebukes from the U.S. intelligence community, which has concluded that Russia did intervene to boost Trump's candidacy. On Tuesday, Bolton acknowledged the election interference — though he asserted that, "taking what we've seen so far, there's no possibility that the outcome of the election would have been changed." Investigations by Congress and the Justice Department, including the probe led by special counsel Robert Mueller, are still ongoing. A dozen Russian intelligence officers were charged in connection with the Justice Department investigation just days before that Helsinki meeting between Trump and Putin. As recently as last week, a Russian accountant was charged with waging information warfare to sway the upcoming midterm elections on behalf of the Kremlin. "The point I made to Russian colleagues today was that I didn't think, whatever they had done in terms of meddling in the 2016 election, that they had any effect on it," Bolton told reporters Monday, "but what they have had an effect in the United States is to sow enormous distrust of Russia." As for the INF Treaty, Bolton says the U.S. intention to withdraw remains just that — an intention. The U.S. has not filed its formal notice of withdrawal yet, though he says it will be done "in due course." But he added that such a withdrawal is necessary to adapt to a post-Cold War global environment, in which the world is not just dominated by two competing powers anymore. He cited efforts in weapons development by China, Iran and others not bound by the restrictions of the INF Treaty. "The reality is, the treaty was outmoded, being violated and being ignored by other countries," Bolton said. "So under that view, exactly one country was constrained by the INF Treaty: the United States."